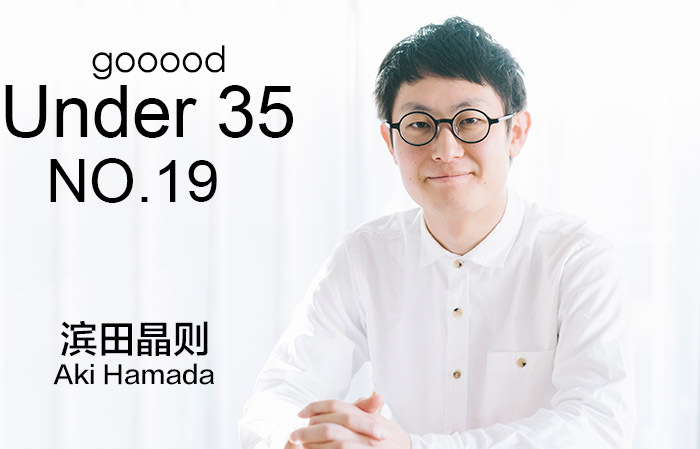 gooood Under 35 NO.19 introduces Aki Hamada, founder of Aki Hamada Architects and working as an architect partner in teamLab. What is your hometown like and why you chose to become an architect? I was born in Toyama Prefecture, Japan where is close to the sea and locates a mountain called Tateyama. My father is an architect, my grandfather is a ship carpenter and he owns a dock. I was inspired by them since very young and has been interested in architecture and fabrication. Before I decided to learn architecture, I was more interested in solving social problems and issues in a direct way. Thus, I choose sociology and psychology in college. During that time, I participated in many open classes of architecture and city planning and gained a lot of knowledge. Little by little, I found architecture could also have effects on society, and then after graduating from sociology, I chose architecture as my major in bachelor and master. 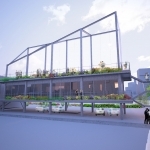 What is the status of young architects in Japan? Young architects don’t have many opportunities in doing architectural practices, and even less opportunities in new architecture projects. So the architects of this generation are mostly to start their career from building renovation and interior design. When I was studying for my master degree, a friend of mine invited me to design a café and from that point I set up studio_01 with Alex who comes from U.S. Even though it is not easy for young architects to work big projects, one can still learn a lot and know better about architecture from those smaller ones, which is also meaningful for architects. I hope my ideas of doing these projects could run far beyond the projects themselves and could be accepted by people as a general ideology. What is your job in teamLab? The work of teamLab is more about digital art, and the projects are always performed in spaces and transform the whole space into an artwork. Thus, they need architects that are professional in dealing with space problems. 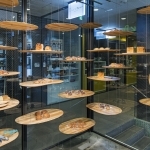 My work here includes the design of exhibition spaces as well as huge amounts of lights and other elements. I used to do parametric design in my projects, which is in accordance with digital way and thinking of teamLab. In the work “Crystal Tree”, we used hundreds of thousands of bulbs, and we had to discuss about the space and lights with programmer. So communication in digital ways plays a very important role in this project. Generally speaking, my job in teamLab is design and communicating with other professionals by same protocol. What have you gained by working in teamLab? Our latest work “Forest of Resonating Lamps – One Stroke ” was also composed of numerous lights allocated in space. The design process has a lot in common with architecture design. 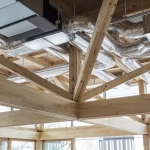 In architecture, we also have to considerate how to arrange the many elements simultaneously, such as roof, sack, handrail, etc., in parametric ways and make them work correctly. Though architectural components are different from bulbs, the ideology of design is the same. In this way, I think we could use parametric design to solve architectural problems. What are the main effects of digital design in your design work? Design requirements could not be efficiently transmit to the programmers if we only provide them drawings. It is better to give them spatial data to illustrate the arrangements of lights in spaces, like CSV document that is commonly used. The programmers could clearly see the location of different elements after entering the data. By merely a digital transformation to the space, programmers could easily intervene in the space design, and corporate with architects for visual operations. This kind of communication between programmers and architects is significant. It is one of the advantages of parametric design to combine people from different professions through the same tool. What’s more, digital design can easily gain feedback information. We could take advantage of digital design in creating models in virtual space, on which unrestricted simulations of airflow, illumination and thermotics are allowed. Thereby, we are able to insert much more information to pursue higher precision. Moreover, by using new technology of digital design, we might be able to do unpredictable designs that are beyond imagination and eventually transcend human beings. What influence does working in teamLab have on your architecture design? Works of teamLab values contents a lot and put people’s experience in the first place. 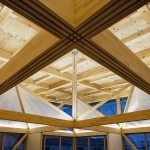 Unlike art creation, architects tend to focus on the “shell” of the space. But for teamLab, it is more important to enhance the contents of the space to bring people unique and new experience, which is what I agree with and I think architecture should be changed from container to content. How to balance the different works? I didn’t pay special attention in balancing different work. On one hand, the design teams are connected with each other. On the other hand, there is no big difference in design methods. Of course architectural design varies from art creation. As long as the number of projects is within our capacity, we would do our best to manage and complete all of them. In order to finish the projects efficiently, we first set up a system for design, which enabled a small studio like us to run many projects simultaneously. It is also the merit of using technology and program to design. What do you think of Metabolism? My theory has much in common with Metabolism which we both agree architectures are all in a metabolization process like live entities. In the coming generation, architectures will experience a big transformation as well as we human beings. It may be incredible for us to talk about this, yet people could progress along with the progress of technology. The world illustrated in <Cybernetics>, written by Norbert Wiener, has a living example. Human evolves with technology as well as architecture. For me, an architecture design should be alive and adapted to the environment. I had a project called “Float”, which was aim to build a huge and light space. So I designed a architecture like a foundation which including the upper ground and the underground parts. 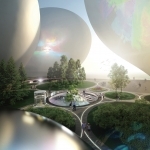 The balloons above are changeable depending on time and uses, and they act like changing with environment, and have a bright comparison with the architecture below which is as invariant ground. How to design a lighter architecture while meets to the requirements of the environment is my design focus. There is a similar ideology in Metabolism is “renewable”. Depending on the volume of the architecture, it cannot be replaced, while by using the modern digital technology, we could change the materials or the surface of architecture. If we could use free-alternating and lighter elements, the architecture would step closer to the Metabolism in present times. Take teamLab’s artwork for example, digital technology makes the design more interactive, which combines art, space and people together. In architectural design, I hope that the relationship between human and architecture could be further enhanced by updating the space experience. Though architecture itself is too enormous to be flexible, the space inside could be different. We could digitalize the architectural elements like what we do in artworks. People could use the architecture with more freedom by merely making one component lighter. I have been thinking of the interface between people and architecture. As freedom is a pursuit of human beings from ancient time, I wish to make the unmovable architecture easier for people to control. 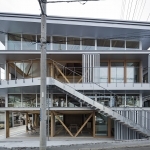 In traditional Japanese architecture, there is a space called “ma”. People could create different spaces using sliding doors, blinds or movable furnace. The space would become a bedroom if you put quilt on the floor. Which impressed me the most is that the meaning of space is changed by high flexibility and it is what I want to approach in my design. 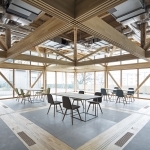 In the architectural design of Ayase circuit board Factory, the partitions could be freely moved along the axis, creating various functional spaces. To transform the workshop into an exhibition hall would make no difference in our design strategy of free space. The key point of our design is to set up a framework with maximum freedom that could provide different functional spaces according to users’ needs. I believe that the architectural components should be light enough when considering the vertical space division. Thus I cut the space at 2.1m height, creating living area below and environment area above. 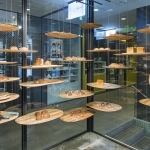 All the facilities for environmental control, such as lighting, ventilation, HVAC and illumination, are integrated in the environment area, where people would not directly interact. This arrangement enables a wider living space below. Besides, the use of space truss structure in the environment area free the living area from vertical supporting elements, further ensure the flexibility of the space. 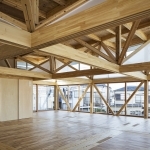 A wooden architecture with no columns is completed as a result. 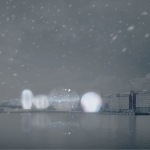 How could new technology make people and architecture more free? It is hard to define the word “free”. I think there are two aspects of freedom. 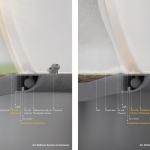 One is that the design itself could be freer by using new technology. It is to say that with the help of new technology, we are able to design more complicate geometric forms. I own a factory at my studio in Toyama, which is the previous dock of my grandfather. There is a CNC router, which could be used to carve wood, fabricate products and wall panels. It is impossible to accomplish complicate design if we don’t update our means of production, not to say realizing free design. Thus I pay much attention on how to turn digital design into real project and digital assembly technique. The other point of freedom is that architecture should provide free experience to people. To reach the above goals, I have to keep learning new things, stepping into new stage of design based on present architectural approaches. 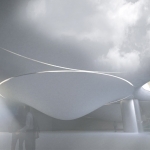 How did you consider the relationship between architecture and light in project228? In project228, I aimed to make architecture a screen. In fact the architecture has only two floors, with columns stretching into the roof terrace, supporting the screen curtain that created an impressive effect from outside. 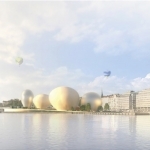 The enormous surface area of architecture and the location on the riverside point to the possibility of the building to be functioned as an outdoor advertising. In day time, it is an architecture as like white sailing ship. 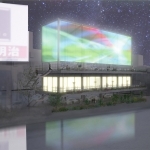 In the night, the architecture changes its appearance along with the video artworks projected on the surface. How could light change the architecture? The relationship between architecture and light is multi-faceted. One factor of light is that it could shine on huge area, making oversized video works possible. 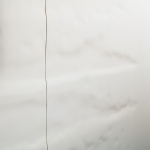 In the project of “Float”, I designed a balloon-like component, which could be used as screen for projection. Thus it is important to create huge areas with minimum weight. Volume and Bigness of architecture becomes the priority in design because light is no weight theoretically. You could say that the form of the architecture was determined by the needs of video projection in this project. What will the architecture be like in the future? There are large amounts of information in video. That’s why people tend to be attracted by video works, as human beings are always interested in objects with high information quantity. Like projection in the space, I have also been considering how to create a high information space without video. 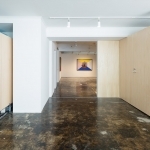 I have worked a project of an art gallery. The artist grew up in Nara, surrounded by the local cob walls. Then he went to study fresco and became a famous fresco artist. 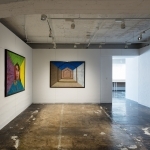 When visiting a gallery, people may feel more information besides the artworks exhibited. 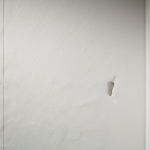 Thus I started to wonder if I could fabricate a wall expressing the story of the artist at resting space. 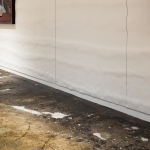 I transformed the texture on the Nara cob walls into digital information and turned it into a new wall by CNC router. People could stare at the wall and feel the history and culture of Nara behind it. 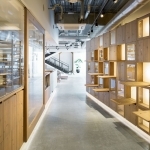 I think that in architectural design, creating space with high information is important. It could be approached by digitalize the characteristic of the site and client oriented story transform the information into a space. I am testing my theory in such small-scaled interior design project. There is a residential project that I am dealing with. Part of the house is covered by glass and there should be handrails on it. I digitalized all the information of handrails, such as angle, sun shadow and visual block, in order to precisely design the elements. When talking about digital design, most people would come up with different kinds of complicated shapes. While it is not the “digital design” that I am interested in. I believe that the mission of architecture is to connect different people, facilitating their communication and be loved by people. 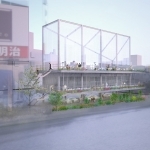 I am trying to rethink about how to design architecture where people would like to gather. It would be even better if I could bring my idea of design into projects out of Japan. I am now focusing on digital art and interior design and transformation of residential. No matter what kind of project it is, I will make no exception in dealing with them.